* A list of all metric prefixes is at the front of Appendix F.
From Planck's Law we can derive two other important relations. First, we obtain the Stefan-Boltzmann 's Law by integrating Eq. (9-2) over the complete spectrum, yielding the total radiant emittance, Wy. Remote-sensing instruments are aimed at a target on the Earth's surface or in space. Radars measure the characteristics of reflected, self-generated signals. For other sensors, an object's spectral radiance, or brightness, depends on its equivalent black-body temperature. This is the temperature of a perfect radiating body which has the same total radiance. 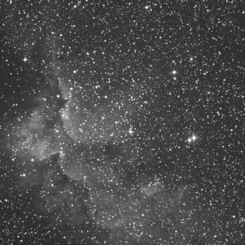 Visual systems, which use Mm or solid-state detectors to form the images, can take advantage of the Sun's reflected energy, based on its blackbody temperature of about 6,000 K. Of course, without sunlight, visual images are much less distinct. On the other hand, systems using infrared and microwave radiometry measure scenes against the Earth's intrinsic thermal radiation background (corresponding to about 300 K). Thus, they can operate day or night, as well as through clouds and other atmospheric disturbances. Note, though, how much weaker the signals are in the RF bands compared to the IR ranges. As Fig. 9-6 shows, the electromagnetic spectrum has many frequency bands for which the Earth's atmosphere is nearly opaque. We must avoid these bands if we wish to observe ground scenes. This phenomenon also allows us to sound the atmosphere and measure such interesting data as the thickness and location of cloud layers, water vapor contained in clouds, and other upper-atmospheric phenomena using the opaque bands. Gouds, rain, and snow tend to produce noise and thus attenuate signals for both communication and remote-sensing, even in the window bands. When a sensor views an area in space, the radiation that reaches the sensor could come from a number of sources. 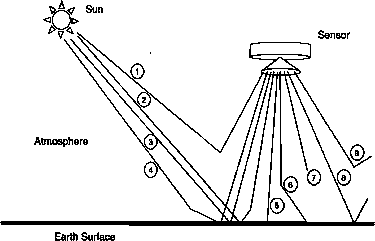 The energy reflected directly from the target is usually the dominant feature of interest for optical remote sensing, but other emitted, reflected and scattered energy can complicate the picture. The primary (direct) and secondary (single scatter) sources of electromagnetic radiation are shown in Fig. 9-7. The sources of radiation in Fig. 9-7 give rise to a number of different strategies for distinguishing different phenomena within the atmosphere or on the surface. For a given application, any of the sources of radiation will either be the subject being analyzed or noise to be minimized. Radiative measurements include the full complexity of all the effects on that radiation such as reflection, refraction, absorption, transmission, and scattering by material substances in solid, liquid, and gaseous phases. Distinguishing and identifying features using remote sensing techniques must take all of these variables into account As Miller and Friedman  advise, "when modeling the real world, allow for some slack to represent reality." Fig. 9-6. Transmission Characteristics of the Earth's Atmosphere. Transparent regions are referred to as windows in the atmosphere. In this discussion, we treat reflective systems (optical systems using minors) and refractive systems (optical lens systems) together and refer to them both as optical systems. Reflective and refractive systems have advantages and disadvantages, which we will discuss later. There are several ways to describe an optical system. Parallel rays of light falling on a perfect lens will all converge at the focal point, whose distance from the lens is called the focal length, f. The focal length largely determines the length of the optical collection system and for a single lens, it is related to the lens surface's radius of curvature. The focal length of a spherical reflecting surface is one-half its radius. For a parabolic reflector whose surface is defined by the equation z2 = 4fy, the quantity/ is the focal length; it equals the distance from the focus to the nearest point on die reflecting surface. 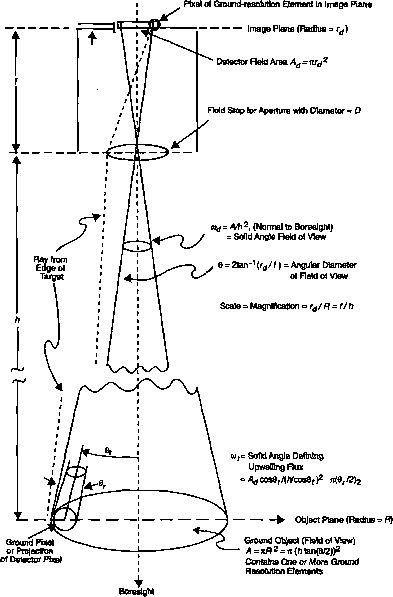 where h is the distance from the spacecraft to the object, rd is the radius of the detector array in the image plane, and R is the radius of the object, with the image and object measured perpendicular to the line of sight The magnification or scale = rj/R is the ratio of the image size to the object size. It is ordinarily a very small number for satellites. We express the scale on the image plane as "1 cm equals x km on the ground." We can also describe an optical element or system by its so-called infinity F-num-ber or F-stop, often written as //(read "F-stop"), F, FNo., or F#. It is defined asf/D, where D is the aperture or diameter of the lens. Image brightness is proportional to l/F-2, so an FA lens gives an image four times brighter than an F-8 lens. Fig. 9-8. 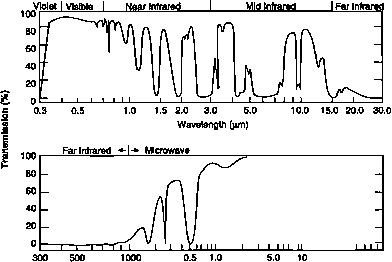 Optical Characteristics of a Refractive System. Note one-to-one correspondence of the ground-resolution element's size to the pixel size at the Image plane. The operating wavelength is A. As resolution elements move away from nadir, flat-Earth approximations become less precise. See Chap. 5 for additional details.